The SafeRack MAUI unit is an excellent choice if you are concerned about the safety of environment and your workers. Compared to other loading racks, MAUI is a self-supporting and portable rack, meaning you can take it anywhere with you when you have to unload the tank trucks. OilTanking Joliet facility is using this rack and they seem super satisfied with it. Today we’re going to OilTanking in Channahon, Illinois. It’s the Joliet terminal. We’re the OilTanking Joliet facility, we’re located just a couple miles south of the village of Channahon. We’re a bulk chemical facility. We handle barge, rail, just liquid chemical. We ship out by tank truck. Our number one goal every day is to protect our people, protect the environment. Our biggest issue is safe access to the top of the trailers. This is probably a typical ladder you have on a truck. The runs are real thin for climbing it in the cold weather and when it’s icy out, your feet can slip off of it pretty easily. We just don’t let our guys go up these ladders. The safe Rack is self-supporting unit which is the main reason I wanted to go with that. We don’t have to let the unit down on the trailer. It’s portable unit, we can take it anywhere along this rail siding when we have to unload tank trucks, it’s right there, it’s handy. 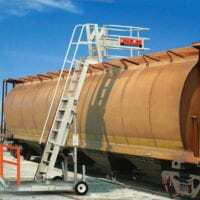 The MAUI unit is a portable access system to get on top of either rail cars or trucks. 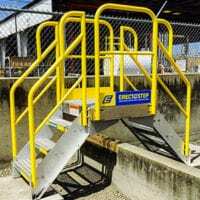 This unit is designed with the four rail cage to get on top of trucks and enclose the hatch area. We put it in place, we chock the wheels on the truck and then we would set the supports here so that the trailer doesn’t move. Then after that we would adjust the height of the ladder. Lower the ladder in place, adjusts it to a place where it snaps into place, then I can climb up to the top of the trailer. Our system is self-supporting, meaning it does not have to rest on the rail car of the truck and it’s important because the top of the trucks are not always flat. Sometimes they have grading and it’s flat, sometimes it’s not flat. So being self-supporting, we don’t have to worry about tipping over and unstable for the operator. I’ve seen some trailers where I wouldn’t stand up when I was up there. I’d stay on my knees and reach over in there and open the dome lid and things like that, instead of actually standing up to do my work, it makes it easier if you can stand up instead of working off of your knees. More comfortable and safer. The other rack we had, I’m not sure of the manufacturer, it had to be supported on the trailer before you went up. Otherwise it wasn’t rated to be freestanding. So you had to lower it down to the trailer before the operator climbed up and you can see the foam pad, they are for it to set on the truck without damaging the truck. So that’s what is your main support once you get it up. It’s just like, that’s one of the points of contact for support. And I think what eventually happened, right here it was like the weight stress and it just kind of finally cracked on it. I’m not climbing up there. And the other thing about the older unit we had is that the tires were pneumatic and it was always a possibility that you’d have a flat tires on the safe rack or solid rubber tire so you don’t have to worry about getting a flat on the unit. I’m hoping this will last a lifetime. I mean it’s affordable rack, its self-supporting and our guy can climb up it without worrying about it tipping over and it’s got a big platform up top to do all the work he needs to do around the hatch.